Rena Maguire and Richard Parker share a tale of Iron Age riders, shields and symbols. Niall Brady, Samuel Connell, Kathryn Maurer, Daniel Cearley, Chad Gifford and Ana Lucía González showcase a successful field school and community collaboration in Roscommon. Chris Corlett explores the possible connections between a floor tile, a chapel and the Marshal family at Ferns. 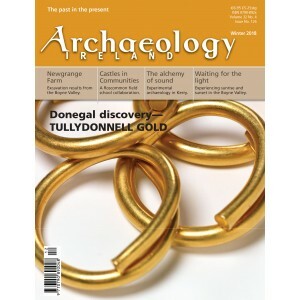 Joanna Leigh, Geraldine Stout and Matthew Stout reveal exciting new excavation results from the Boyne Valley. Clare Tuffy shares her experiences of sunrise and sunset at the Boyne Valley tombs. Holger Lönze reports on the recent musically themed Umha Aois experimental archaeology symposium in Kerry. Gabriel Cooney remembers Ruaidhrí de Valera on the 40th anniversary of his final conference. In this contribution to the Know Your Monuments series, Muiris O’Sullivan and Liam Downey present an overview of the types of cheese made in Ireland from earlier times and outline the virtual cessation of cheese-making by the early modern period, followed in the twentieth century by the progressive development of the Irish cheese industry. Shirley Markley unearths a forgotten late medieval building technology. Fulacht fats—Bronze Age cooking confirmed?